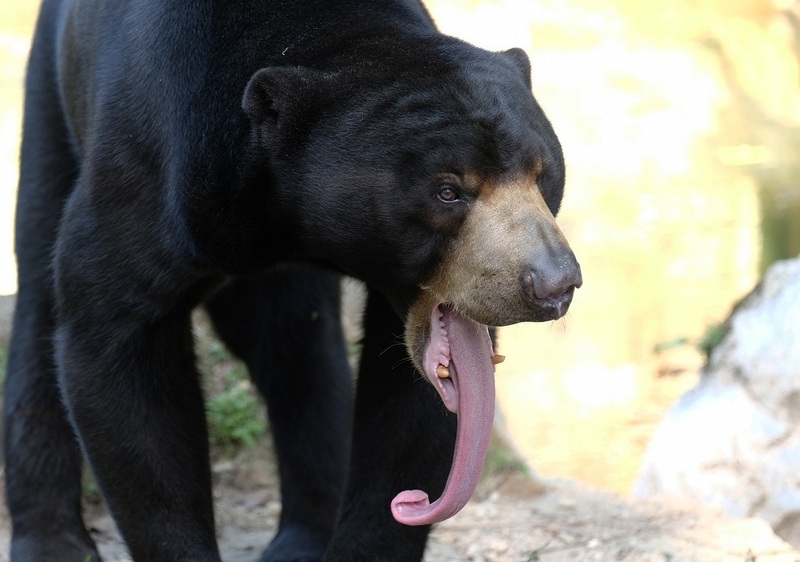 Meet the Malayan Sun Bear (Helarctos malayanus), a mammal belonging to the Ursidae family. The bear is native to Bangladesh, Brunei, Cambodia, India, Laos, Malaysia, Myanmar, Thailand, Vietnam and the islands of Sumatra and Borneo in Indonesia, where it thrives in tropical evergreen forests. With an insatiable appetite for honey and honeycombs, the Malayan Sun Bear is known as the ‘honey bear’, with the bear’s Indonesian name of ‘Beruang madu’ (literal translation of ‘honey bear’) also reflecting this. 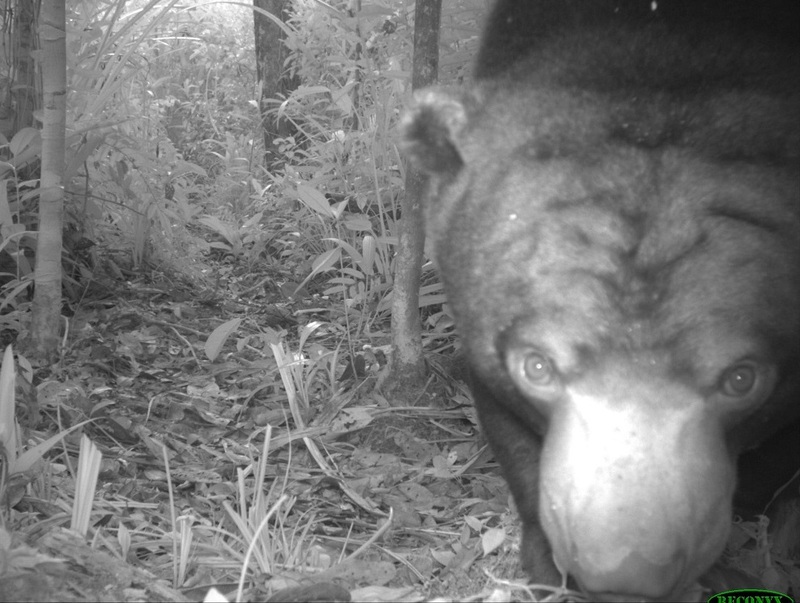 The Malayan Sun Bear is one of the 73 mammal species which have been identified in the Restorasi Ekosistem Riau (RER) area within the Kampar Peninsula. The Malayan Sun Bear holds a Vulnerable (VU) conservation status issued by the International Union for Conservation of Nature (IUCN), and is one of the 17 globally-threatened mammal species identified in RER. The sun bear is considered to be the smallest of the bear species, with adults typically being about 120 to 150 cm long and weighing 27 to 80 kg. Males tend to be about 10 to 20 per cent bigger than females. The Malayan Sun Bear’s fur is usually jet-black, short and sleek, with a somewhat crescent-shaped patch found on its breast that ranges between brownish-yellow to dirty white in colour. Its muzzle is short and light-coloured, with the white area extending above the eyes in most cases. The bear’s paws are large and heavy, while its claws are large, curved and pointed – features which are thought to be ideal for extensive climbing of trees. The Malayan Sun Bear sleeps in a nest it builds on a tree. The nest is made out of a mass of tree branches, similar to that built by an orangutan or Giant Squirrel. Besides honey, the omnivorous Malayan Sun Bear feeds primarily on bees and beehives, termites, ants, beetles and fruit, especially figs. It has an exceptionally long tongue of 20 to 25cm which it can extend during feeding to extract honey and insects. The Malayan Sun Bear is known to use its sharp claws and teeth to tear open trees in search of wild bees, leaving behind shattered tree trunks. It is also known to consume carrion (decaying animal flesh) from other carnivores’ kills. RER harbours a good and healthy population of Malayan Sun Bears, proven by numerous images and video clips of female bears wandering the area with their cubs of varying ages. It is not uncommon for the RER team to come across trees with claw marks from the Malayan Sun Bear, while roaming the forest. As there is food available year-round in tropical regions, the sun bear differs from other bear species in that it does not need to hibernate. Female sun bears mate at about three years of age, with the gestation period being about 95 to 174 days. The sun bear typically gives birth to one or two cubs weighing less than 350g each. Much of the Malayan Sun Bear’s habitat has been destroyed in past decades as a result of extensive deforestation for plantation development and logging practices. However, the biggest threat to the sun bear are humans, with sun bears being a mainstay of illegal wildlife trade, particularly in Southeast Asia where they are targeted for their gallbladders and bile, used as a traditional medicinal ingredient. As a result, the Malayan Sun Bear has been listed as an Appendix I species by CITES (Convention on the International Trade of Endangered Species) since 1979. CITES I species are those threatened with extinction. Within Indonesia, the Malayan Sun Bear is officially protected by law. With human threat threatening the species’ survival, wildlife biologist Wong Siew Te founded the Bornean Sun Bear Conservation Centre in Sandakan, Sabah in Malaysia in 2008, with the sole mission of sun bear conservation and rehabilitation.